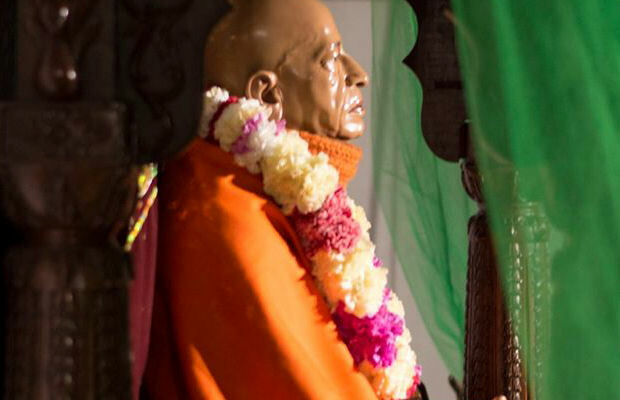 Festival Report - Srila Prabhupada Festival! ~ The Toronto Hare Krishna Temple! Festival Report - Srila Prabhupada Festival! Though many of us may have been a bit tired after ringing in the New Year, the Toronto Hare Krishna community gathered up all their energy and enthusiastically celebrated the annual Srila Prabhupada Festival on the evening of January 1st, 2016! The festival is celebrated annually to give tribute and thanks to Srila Prabhupada for starting the Hare Krishna movement in the West thereby delivering the message of Sri Krishna worldwide. When he was 70 years old, Srila Prabhupada traveled by a cargo ship to the West, following the instructions of his spiritual master to spread the message of Krishna Consciousness to the Western world. On the evening of January 1, 2016 the devotees at the temple started the Srila Prabhupada Festival by collectively offering flowers to the feet of Srila Prabhupada. During this ceremony the Deity of Srila Prabhupada beamed with delight and was surrounded by a sea of beautiful flowers. Shortly thereafter, Bhaktimarga Swami showed a video honoring Srila Prabhupada’s contributions to ISCKON and lectured on what devotees can do in their lives to further Srila Prabhupada’s vision. With renewed spirits and new oaths the devotees all joined together in an ecstatic kirtan and closing kirtan (arati). Later, a vegetarian feast was served to all the devotees and it maintained a simple cooking style while having a high taste. As the festival concluded all the devotees left with more energy than ever before and seemed ready to embrace the New Year and its new beginnings!